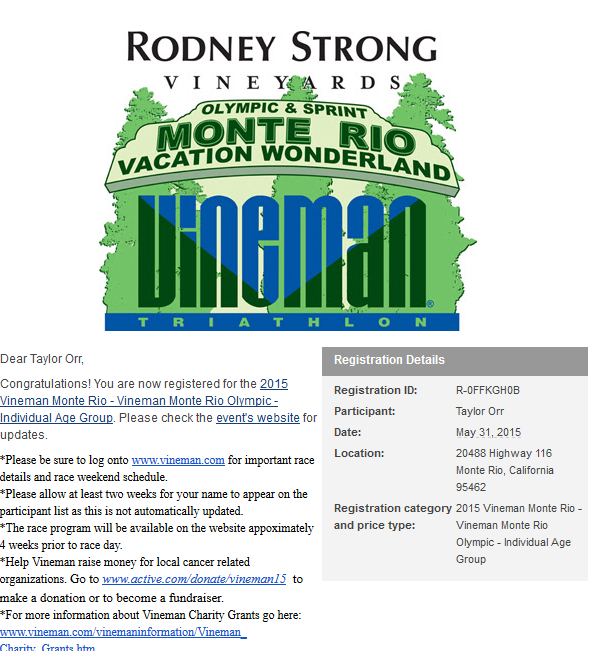 Jesse and I are registered for Vineman Monte Rio, Vineman’s Olympic-distance triathlon in May. Jesse is also racing Vineman 70.3 next year; although I want to make Vineman or Oceanside my first half ironman, this year I’ve learned to avoid spreading myself too thin and to choose only one lofty goal. Next year’s focus will be the Berlin Marathon in September (if we get in; we find out later this month), and I don’t want to jeopardize my run fitness by logging extensive biking mileage. Jesse raced Monte Rio last year and placed second in his age group. He convinced me that I’d love the race – the swim is calm (and shallow), the bike is shaded (no second degree burns this time), and the run is fast. We’ve recently observed that Jesse’s trophies are all from races in wine country (Vineman Monte Rio, Vineman Aquabike, and Envirosports Napa Sprint Triathlon); he’s really proficient at rolling hills! Training for Monte Rio will serve as great crosstraining and bike exposure (I haven’t biked since Wildflower last May…whoops) without sacrificing too much time before marathon training ramps up. Vineman 70.3 is sold out (just like last year), but Vineman Monte Rio is still open! Registration is relatively cheap ($115), so register now! I peaked at the Monte Rio website. Beautiful countryside. I love Monte Rio! It’s a really fun course (save for a few miles of bumpy road on the bike). I hope to do it again too! That’s good to hear (minus the bumpy road). Did you do it last year? Jesse raced it and said the road had recently been repaved.